For Lawrence English, sound is seeing. Or to put it more accurately, his work is predicated on the belief that analysing, repurposing, and even distorting sound can reveal hidden or obscured patterns behind cultural phenomena. Sound is a tool for searching. This thinking has always informed his varied (and consistently collaborative) career as an avant-garde composer and sound artist—right up until recent albums Cruel Optimism (2017) and Selva Oscura (2018), a partnership with William Basinski. But with the exhibition Rhythm of Protest at Lismore Regional Gallery, this foundational theme is allowed its own platform to expand and, as it happens, disturb. 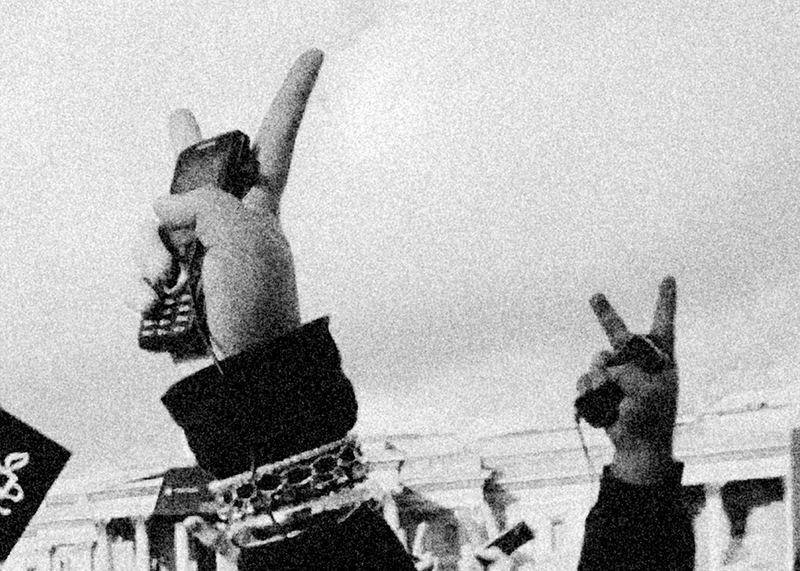 At the heart of these works, which range from photography to video and sound installations, lies an exploration of a symbiotic relationship between sound and activism (or the suppression of activism)—in particular the ‘weaponisation of sound’, and how this has evolved since the 1960s. English’s preoccupation is with the militant use of noise employed to subdue and disperse crowds at mass protests, as well as other sounds of unrest in these highly-charged, unpredictable events. Interestingly, English’s political view of protest events is admirably balanced: during the Q&A at the launch of the exhibition, he expressed sympathy for both demonstrators and police, and the pressures each are under in these settings.1 In fact, it is a credit to English that while the exhibition is a meditation on protest, in its abstractness and ambience it is not actually an exercise in protest itself. The onus is firmly on the visitor to construct socio-political meaning and implications, and to discover what revelations such a study of sound can divulge. A history of this weaponisation of sound is tracked in Spectral Matters (2018), one of five pieces that make up the exhibition, and one that addresses the nightmare of aural tyranny. Taking a scientific, somewhat clinical approach, English presents a series of black and white ‘charts’ across three panels. Viewed together, these charts form a fifty-year acoustic chronicle of the sonic intensity of protest events—the images are reminiscent of waves in a digital sound file. English’s year zero is 1968 and the Paris student riots, a time of thin, high peaks: perhaps a shriller, more bearable time for activists’ ears. By 2018, authorities have more formidable technology to disperse crowds, with the notorious Long Range Acoustic Device (LRAD) responsible for the dark, thick, bar of graphics on the third panel in this triptych. The LRAD is a daunting instrument of sound that has been used as a ‘sonic weapon’ for crowd control, with the power to cause permanent damage to human eardrums. The device seems to fascinate and haunt English in equal measure. During the Q&A he was animated when talking about its technology and sheer power to overwhelm hordes of people, but also highly attuned to its brutality. Spectral Matters provides a starkly visual, quantitative indication of how the LRAD has brought a new level of aural aggression to the quelling of protestors. This brings a threatening, insidious and dystopian tone to Rhythm of Protest. Another visual work, Solicitudes (2018), expresses a key English idea: ‘latent sound’. This refers to the notion that sound is somehow trapped inside other mediums, in this case static visual images. 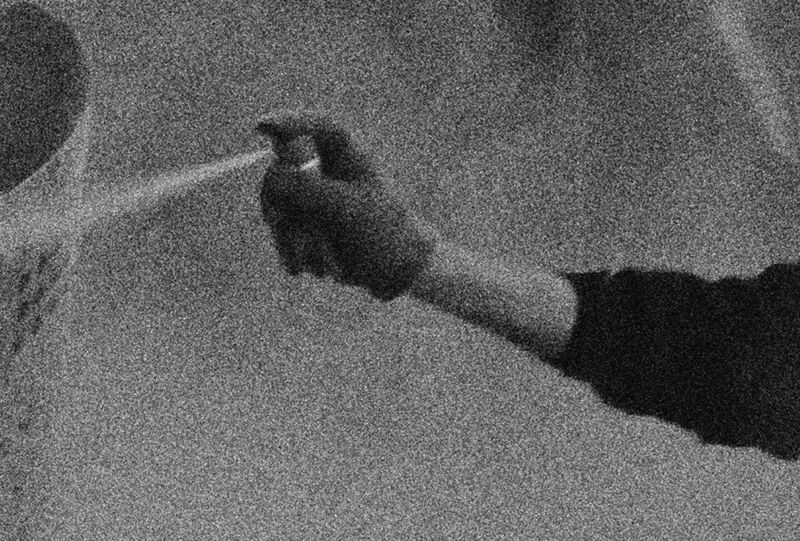 These mysterious, grainy, grayscale photos all depict some kind of motion—in some cases violence—from occasions of mass protest. Each shows the intersection of human body and tool, be it whip, drum, spray paint (or is it pepper spray?) or phone. The latent sound is suggested by the gestures and the objects, but it is also in the roughness of the images: it is as if a certain soundtrack of chaos, or jittery white noise, emerges from the spaces between the grains in these photos. The blotches have a voice. This marriage of concept with so-called ‘lo-fi’ production values represents English’s most engrossing work in the exhibition. In the centre of the room lies a large video installation placed horizontally on the floor: Classification of Discontinuities (2014). The footage shows English’s legs and signature sharp black boots, camera pointing downwards from his waist, slowly walking in Tiananmen Square in 2014 on the 25th anniversary of the student uprising. It is spellbinding to spend time with this silent piece, as it soon reveals itself as the most musical work here. The artist’s steady pacing, across paving stones imbued with their own latent sound, combines with the lines of the pavement to create a strange kind of polyrhythm born of visual patterns and implied noise. In this way, Classification of Discontinuities is the most kinetic, uplifting and melodic work in Rhythm of Protest, and acts as a counterbalance to the grim impression left by the effects of the LRAD. Against these three centrepiece creations, the two artworks in Rhythm of Protest that do actually employ audible sound feel slightly secondary. One, Flash Point (2018), is an example of English’s deconstruction through distortion. Having examined recordings from the G20 protests in Pittsburgh in 2009 and the Occupy Oakland demonstrations in 2011, he has selected certain ‘moments of rupture’ and stretched their audio out temporally so that fleeting, incendiary moments become a drawn-out flow of sound. The noise, the volume of which is very low, is a little like the ocean or the sound of a city heard from a high-rise window. The actual flash point, then, is drowned out and submerged. The other sound installation, Scoring Resistance (2019), is located outside the gallery in the form of speakers positioned over an outdoor quadrangle. At regular intervals, preeminent words from protest movements over the decades (as selected by English) are recited by residents of Lismore, who provided him with recordings prior to the exhibition. This more direct, literal work doesn’t offer quite the depth of the rest of Rhythm of Protest, although its location at a separate site is appropriate, providing an accessible and comparatively simple entry point to English’s more challenging work inside. It may be successful in this aspect, but to leave the gallery, enter the blinding sunshine, and hear the words broadcast across the quadrangle, is to bring English’s ethereal conjuring of sound down to the murky and all-too-reductive realm of language. 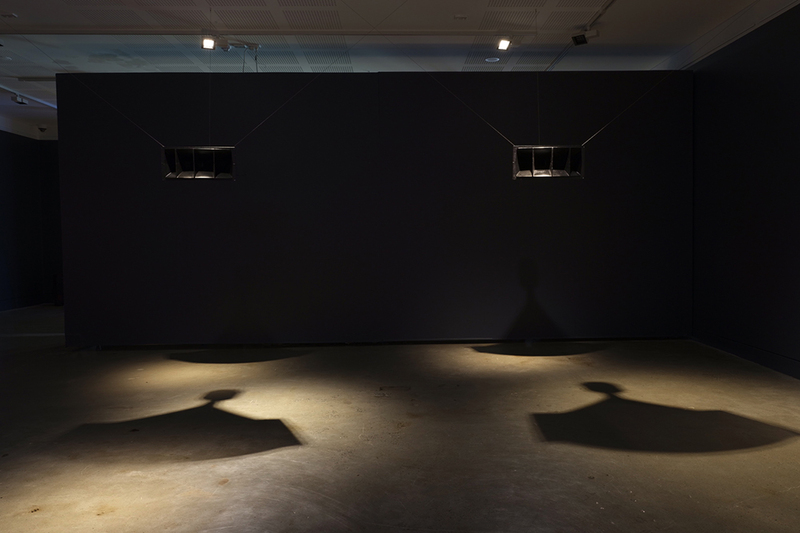 The contrast in tones is sharp, but rather than interrupt the coherence of the exhibition, Scoring Resistance allows English to put aside interrogations of history and technology and consider people on a more intimate level than as faceless (or voiceless) masses to be controlled—and it engages with contemporary Lismore. Whether Rhythm of Protest is the best way to experience English’s obsessive and dialogic approach to sound—as opposed to his recordings or his performances—is debatable. But the exhibition is a hugely welcome injection of a progressive, international, political, avant-garde aesthetic in this regional location. At its essence, Rhythm of Protest is a sobering reminder that the aural sphere is contested territory, subject to politicisation, exploitation, colonialism, hegemony, and violence.